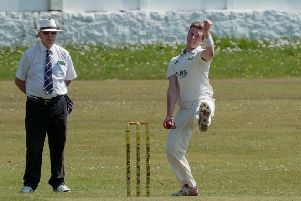 Clitheroe clinched a fourth-successive Ribblesdale League title with an eight-wicket win at Settle on Saturday. With Settle second in the table, Paul Gaskell’s men knew victory at Marshfield would make them uncatchable with two games remaining, and they just about did enough in a low-scoring encounter. Settle won the toss and elected to bat, but were dismissed for 99 in 34.2 overs. Jack Dewhurst and Ali Ross had success with the ball, the former having John Davidson caught behind for 4 at 10, before Ross trapped Tom Davidson for 5 at 17. Asif Fazal (22) and Robbie Davidson (11) shared 19 – the best partnership of the innings, but Ross bowled the latter to spark another clatter of wickets. Fazal was caught by Ross off the bowling of Dewhurst, and Thomas Strickland lasted 10 balls for 3 before being out lbw to Ross. William Davidson was bowled by Ross for 3, and Tabassum Aziz caught by Charlie Dewhurst off Ross for 15 – his fifth victim. Ben Hulse was caught behind off Dewhurst for 3, before Saud Ahmed mopped up the tail, seeing off David Worthington (4) and Oliver Whyte (0). Hassan Fazal finished unbeaten on 19, as Ross took 5-34, Jack Dewhurst 3-38 and Ahmed 2-15. Clitheroe were struggling in reply at 18-5, as openers Ross and Neil Bolton departed without scoring, while Aneeq Hassan (8), professional Janaka Guneratne (2) and Charlie N Bolton (0) also departed cheaply. Sam Mulligan (23) held things together, and shared 34 with Jack Dewhurst (21), before adding 30 with Peter Dibb, whose 26 not out saw Clitheroe over the line with two wickets and 4.1 overs remaining. Hassan Fazal took 4-37, and Tom and William Davidson two wickets apiece, but it wasn’t enough for the hosts to deny Clitheroe. Clitheroe now look to round off the campaign as unbeaten champions. On Saturday, they are at Oswaldtwistle Immanuel, before a derby at Chatburn Road against Whalley on Saturday, September 10th, wickets pitched at 1-30 p.m.